This is a display of echo intensity (reflectivity) measured in dBZ. The base reflectivity images in Precipitation Mode are available at four radar "tilt" angles, 0.5°, 1.45°, 2.40° and 3.35° (these tilt angles are slightly higher when the radar is operated in Clear Air Mode). A tilt angle of 0.5° means that the radar's antenna is tilted 0.5° above the horizon. Viewing multiple tilt angles can help one detect precipitation, evaluate storm structure, locate atmospheric boundaries, and determine hail potential. This display is of maximum echo intensity (reflectivity) measured in dBZ from all four radar "tilt" angles, 0.5°, 1.45°, 2.40° and 3.35°. This product is used to reveal the highest reflectivity in all echoes. When compared with Base Reflectivity, the Composite Reflectivity can reveal important storm structure features and intensity trends of storms. This is the same as the Base Radial Velocity, but with the mean motion of the storm subtracted out. This product is available for four radar "tilt" angles, 0.5°, 1.45°, 2.40° and 3.35°. Finding the presence and approximate size of hail (used in conjunction with spotter reports). VIL is computed assuming that all the echoes are due to liquid water. Since hail has a much higher reflectivity than a rain drop, abnormally high VIL levels are typically indicative of hail. Locating the most significant thunderstorms or areas of possible heavy rainfall. Predicting the onset of wind damage. Rapid decreases in VIL values frequently indicate wind damage may be occurring. The Echo Tops image shows the maximum height of precipitation echoes. The radar will not report echo tops below 5,000 feet or above 70,000 feet, and will only report those tops that are at a reflectivity of 18.5 dBZ or higher. In addition, the radar will not be able to see the tops of some storms very close to the radar. For very tall storms close to the radar, the maximum tilt angle of the radar (19.5 degrees) is not high enough to let the radar beam reach the top of the storm. For example, the radar beam at a distance 30 miles from the radar can only see echo tops up to 58,000 feet. The VAD Wind Profile image presents snapshots of the horizontal winds blowing at different altitudes above the radar. These wind profiles will be spaced 6 to 10 minutes apart in time, with the most recent snapshot at the far right. If there is no precipitation above the radar to bounce off, a "ND" (Non-Detection) value will be plotted in knots. Altitudes are given in thousands of feet (KFT), and the time is GMT (5 hours ahead of EST). The colors of the wind barbs are coded by how confident the radar was that it measured a correct value. High values of the RMS (Root Mean Square) error (in knots) mean that the radar was not very confident that the wind it is displaying is accurate — there was a lot of change in the wind during the measurement. This should not be used for protection of life and/or property. Weather Underground's NEXRAD radar product incorporates StrikeStar data. 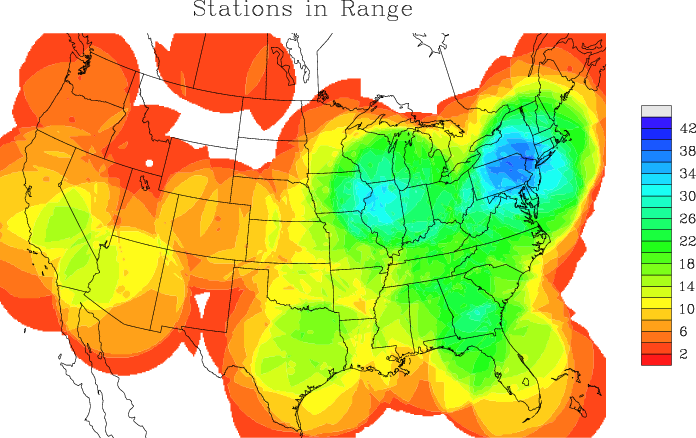 StrikeStar is a network of Boltek lightning detectors around the United States and Canada. These detectors all send their data to our central server where the StrikeStar software developed by Astrogenic Systems triangulates their data and presents the results in near real-time. The Terminal Doppler Weather Radar (TDWR) is an advanced technology weather radar deployed near 45 of the larger airports in the U.S. 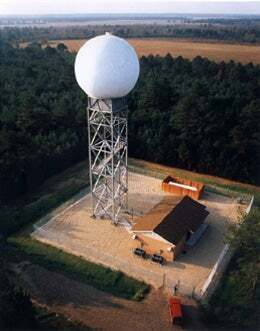 The radars were developed and deployed by the Federal Aviation Administration (FAA) beginning in 1994, as a response to several disastrous jetliner crashes in the 1970s and 1980s caused by strong thunderstorm winds. The crashes occurred because of wind shear--a sudden change in wind speed and direction. Wind shear is common in thunderstorms, due to a downward rush of air called a microburst or downburst. The TDWRs can detect such dangerous wind shear conditions, and have been instrumental in enhancing aviation safety in the U.S. over the past 15 years. The TDWRs also measure the same quantities as our familiar network of 148 NEXRAD WSR-88D Doppler radars--precipitation intensity, winds, rainfall rate, echo tops, etc. However, the newer Terminal Doppler Weather Radars are higher resolution, and can "see" details in much finer detail close to the radar. This high-resolution data has generally not been available to the public until now. Thanks to a collaboration between the National Weather Service (NWS) and the FAA, the data for all 45 TDWRs is now available in real time via a free satellite broadcast (NOAAPORT). We're calling them "High-Def" stations on our NEXRAD radar page. Since thunderstorms are uncommon along the West Coast and Northwest U.S., there are no TDWRs in California, Oregon, Washington, Montana or Idaho. A Terminal Doppler Weather Radar (TDWR). Image credit: NOAA. The TDWR is designed to operate at short range, near the airport of interest, and has a limited area of high-resolution coverage — just 48 nm, compared to the 124 nm of the conventional WSR-88Ds. The WSR-88Ds use a 10 cm radar wavelength, but the TDWRs use a much shorter 5 cm wavelength. This shorter wavelength allow the TDWRs to see details as small as 150 meters along the beam, at the radar's regular range of 48 nm. This is nearly twice the resolution of the NEXRAD WSR-88D radars, which see details as small as 250 meters at their close range (out to 124 nm). At longer ranges (48 to 225 nm), the TDWRs have a resolution of 300 meters — more than three times better than the 1000 meter resolution WSR-88Ds have at their long range (124 to 248 nm). 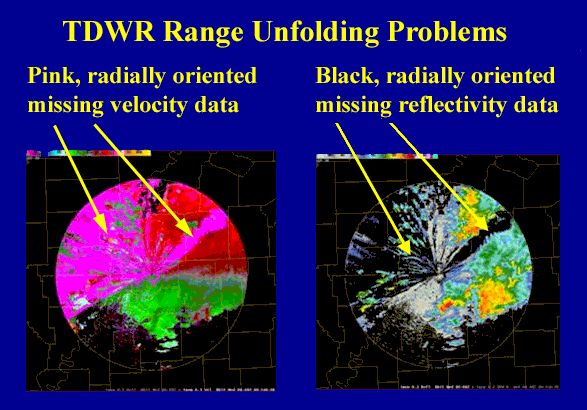 The angular (azimuth) resolution of the TDWR is nearly twice what is available in the WSR-88D. Each radial in the TDWR has a beam width of 0.55 degrees. The average beam width for the WSR-88D is 0.95 degrees. At distances within 48 nm of the TDWR, these radars can pick out the detailed structure of tornadoes and other important weather features (Figure 2). Extra detail can also been seen at long-ranges, and the TDWRs should give us more detailed depictions of a hurricane's spiral bands as it approaches the coast. View of a tornado taken by conventional WSR-88D NEXRAD radar (left) and the higher-resolution TDWR system (right). 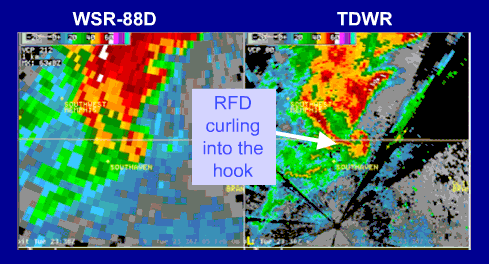 Using the conventional radar, it is difficult to see the hook-shape of the radar echo, while the TDWR clearly depicts the hook echo, as well as the Rear-Flank Downdraft (RFD) curling into the hook. Image credit: National Weather Service. The most serious drawback to using the TDWRs is the attenuation of the signal due to heavy precipitation falling near the radar. Since the TDWRs use the shorter 5 cm wavelength, which is closer to the size of a raindrop than the 10 cm wavelength used by the traditional WSR-88Ds, the TDWR beam is more easily absorbed and scattered away by precipitation. This attenuation means that the radar cannot "see" very far through heavy rain. It is often the case that a TDWR will completely miss seeing tornado signatures when there is heavy rain falling between the radar and the tornado. Hail causes even more trouble. Thus, it is best to use the TDWR in conjunction with the traditional WSR-88D radar to insure nothing is missed. 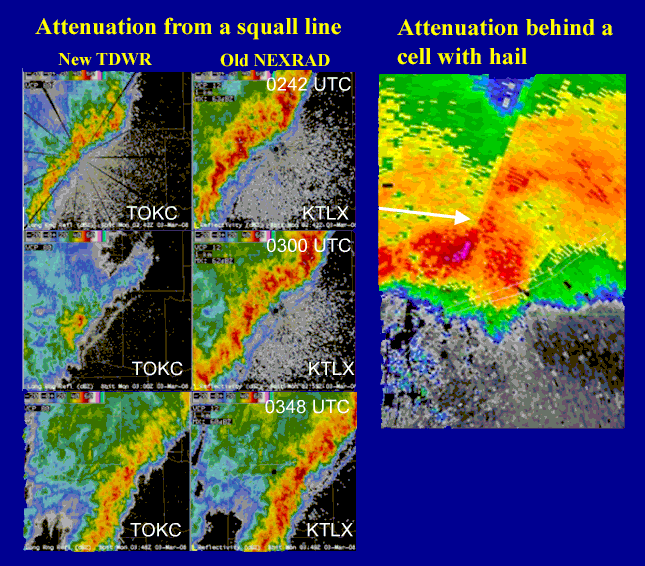 View of a squall line (left) taken using a TDWR (left column) and a WSR-88D system. A set of three images going from top to bottom show the squall line's reflectivity as it approaches the TDWR radar, moves over the TDWR, than moves away. Note that when the heavy rain of the squall line is over the TDWR, it can "see" very little of the squall line. On the right, we can see the effect a strong thunderstorm with hail has on a TDWR. The radar (located in the lower left corner of the image) cannot see much detail directly behind the heavy pink echoes that denote the core of the hail region, creating a "shadow". Image credit: National Weather Service. Another serious drawback to using the TDWRs is the high uncertainty of the returned radar signal reaching the receiver. Since the radar is geared towards examining the weather in high detail at short range, echoes that come back from features that lie at longer ranges suffer from what is called range folding and aliasing. For example, for a thunderstorm lying 48 nm from the radar, the radar won't be able to tell if the thunderstorm is at 48 nm, or some multiple of 48 nm, such as 96 or 192 nm. In regions where the software can't tell the distance, the reflectivity display will have black missing data regions extending radially towards the radar. Missing velocity data will be colored pink and labeled "RF" (Range Folded). In some cases, the range folded velocity data will be in the form of curved arcs that extend radially towards the radar. Typical errors seen in the velocity data (left) and reflectivity data (right) when range folding and aliasing are occurring. Image credit: National Weather Service. For those of you who are storm buffs that will be regularly using the new TDWR data, you can download the three Terminal Doppler Weather Radar (TDWR) Build 3 Training modules. These three Flash files, totaling about 40 Mb, give one a detailed explanation of how TDWRs work, and their strengths and weaknesses. The National Climatic Data Center offers free U.S. mosaics for the past 10 years. Plymouth State College offers single-site radar images of all radar products going back several weeks.